Turpentine Brush is a member of the Sunflower Family. It is a small bush which grows to 3 feet in height and has light green to grayish green linear leaves. The plant typically grows in canyons and along rocky slopes at elevations between 3000 - 6000 feet. The Turpentine Brush gets its name from the fact that its leaves smell like turpentine when crushed. 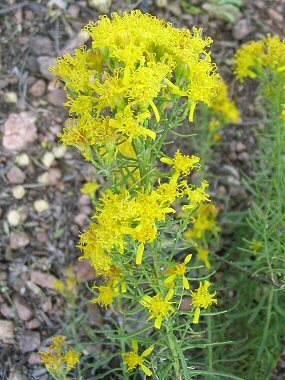 The plant typically blooms between July - September and produces yellow rayed flowers to 3/8 inches in length which grow in a dense cluster at the ends of the leafy branches.